Note: Although more or less the requirements are same for all the nationalities however this information applies to only Pakistani nationals with UAE residency visa. The overall experience was average to get an Italy visa; it took me almost 20 days altogether from the date of application to getting the visa stamped on my passport. However, there are a couple of things you need to know and arrange before you apply. Italian Consulate Dubai has appointed CKGS to process the visa applications as some consulates or embassies have appointed VFS such as France, Austria and Greece. You need to book an appointment online before submitting your application at the application centre. I recommend scheduling an appointment first as, during the holiday season you get an appointment after 3 or 4 weeks, you can calmly gather your documents during that time. You can apply at Italian Consulate Dubai only if you are a resident of Dubai or northern emirates such as Sharjah, Ajman or Ras Al Khaimah. If you are resident in Abu Dhabi, you need to apply at Embassy of Italy in Abu Dhabi. While a Schengen visa allows you to travel freely within all Schengen countries, and the visa rules and procedures are almost the same for all Schengen countries, there are rules about where you should apply. Some countries are particularly strict on this aspect and might refuse you entry to their territory if the rule is not respected. Therefore, if you intend to travel to one Schengen country, you should apply at that country’s consulate or embassy. If you intend to travel to more than one Schengen countries, the application must be dealt with by the consulate of the primary destination. The main destination is the destination where you are going to spend the most number of nights during your trip. If you are going to spend the same number of nights in two or more Schengen countries, then you apply with the consulate of the country where you will be entering the Schengen territory first. In my case I was planning to spend two weeks in Italy, two weeks in Spain and my planned point of entry was Rome, Italy. So applying at Italian Consulate was the obvious choice. one passport size colour photograph, white background, please check the specifications, please make sure it’s recent, taken within last six months. 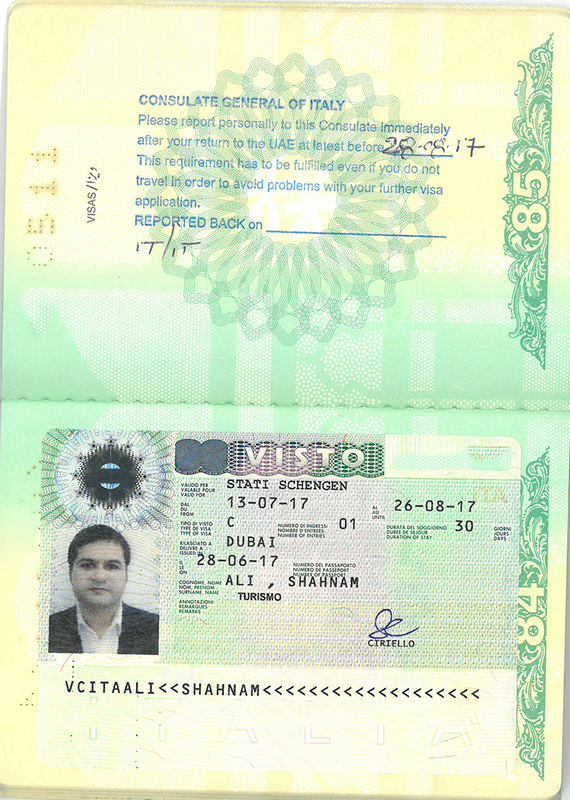 Photocopy of UAE Residence Visa valid at least 90days from the date of the intended end of the requested visa. Previous Schengen, USA, UK visa photocopy. Your monthly salary and start of employment date. NOTE: The owner of a company would require NOC and Trade license copy, other dependents require NOC from the sponsor (passport copy and visa copy is required from the sponsor). If you are the applicant, you cannot sign the letter yourself. Bank statement for the last three months to prove you have adequate financial means. It should be on bank letterhead or photocopies with original bank stamp. They do not accept online statements. Confirmed Hotel Booking, I use Booking.com as they have no down money accommodations available that means you can cancel it for free if your plans get changed. Medical travel insurance: minimum coverage euro 30, 000 inclusive of repatriation flight. As in UAE everyone already holds an insurance policy, you can check with your insurance company if they provide cover in Europe. My insurance policy covers the whole world except Canada and USA hence I did not need to buy a new one. I just attached a letter from my insurance company confirming the coverage in Europe. It’s critical; you cannot withdraw your passport once you’ve submitted your application. Usually the processing time for visa application is five to fourteen days. The fee for Italian tourist visa from Dubai is 263 AED, and CKGS service fee is 100 AED for regular service. You can get the latest information about fee and charges here. They also charge you “convenience fee” if you make payment with credit/debit card, in my opinion, it’s quiet “inconvenient”. As I mentioned above, you need to take appointment online, and these are available on working days only from Sunday to Thursday 9 am to 5 pm. You can access appointment section of the website here. You can opt for an online application form, or you can download the application form from the site and fill it. I was applying for my visa in June, and it was peak holiday season. On 1st June, I was trying to get the earliest appointment, but the nearest one was available on 27th June, and it was not feasible to me. So I opted for VIP/premium services which charged me 220 AED extra but I got an appointment on 8th June. Despite having paid for premium services, I had to wait for almost 2 hours for my turn to come. CKGS do have photo facility at the centre, though they charge extra for this service to regular customers for me it was free as I had already paid for premium service. On 12th June I received an email from CKGS that I have an interview at Italian Consulate on 27th June, it was entirely unexpected for me as I have applied and received Schengen visas many times earlier but no embassy or consulate asked me to come for an interview. On 27th June I reached World Trade Center, 8th Floor where Italian consulate office is. After waiting for almost half an hour, my interview turn came. It was a quick standing interview with an officer behind the glass. She asked me the usual questions such as how many days I am going to stay? Which places I intend to visit etc. at the end of the interview, she informed me that she’d report this conversation to the visa officer and then a decision will be made. On 28th June I received an email from CKGS that my visa application has been processed by Italian Consulate and my passport is being dispatched to me. Next day I received my passport with visa stamped on it. However, it also had a stamp on it stating that I need to report to Italian consulate upon my return from Europe, later I came to know that this requirement is for specific nationalities only. Visa was granted for total 30 days of stay with visa validity of 45 days. Heading to Italy? Check out my blog for useful tips to save money and get best out of your trip. Looking for more specific information or got any question? Do post it in the comments and I’ll respond as soon as I can. How can you get complimentary access to 750+ airports lounges worldwide? For how long should we provide “documents showing the income” to get visa successfully from embassy? I live in Dubai but got a job offer from Italy as a nanny maid ,I had my visa with me which was send through fax from there. can the visa be stamped if I bring them to Italy embassy in Dubai ?? Before picking off to Italy . Usually 3 weeks, but depends on the number of visa applications they receive in that particular time. In this case only salary certificate is sufficient.